Deadline Detroit - The Artist vs. the Developer: Is Her Detroit Mural Protected Under Federal Law? The Artist vs. the Developer: Is Her Detroit Mural Protected Under Federal Law? To call this a colorful legal issue states the obvious. Detroit painter Katherine Craig's federal court filing Tuesday also is a test of artists' rights. She's suing to keep a Bloomfield Hills developer from removing or altering her technicolor mural (above and below) on a century-old building designed by Albert Kahn. The nine-story site is being converted for lofts, condominiums and offces. Katie Craig poured, splattered and sprayed more than 100 gallons of paint on this nine-story building in the Milwaukee Junction area north of downtown. (Facebook photos). For Katherine Craig, the mural is more than a marker of North End’s rising status. The so-called “bleeding rainbow” mural is a cornerstone of her career. And now, since the building’s owner aims to sell or redevelop the property, the artist is taking legal action to protect her work. The artist is represented by attorney Deepak Gupta of Washington, D.C. and Chicago lawyers Edward A. Wallace and Amy E. Keller. Craig, a 31-year-old who goes by Katie, earned a fine arts degree in 2008 from Detroit's College for Creative Studies and a master of fine arts from Cranbrook Academy of Art. She's a co-founder of North End Studios, a gallery on West Grand River Avenue near New Center. 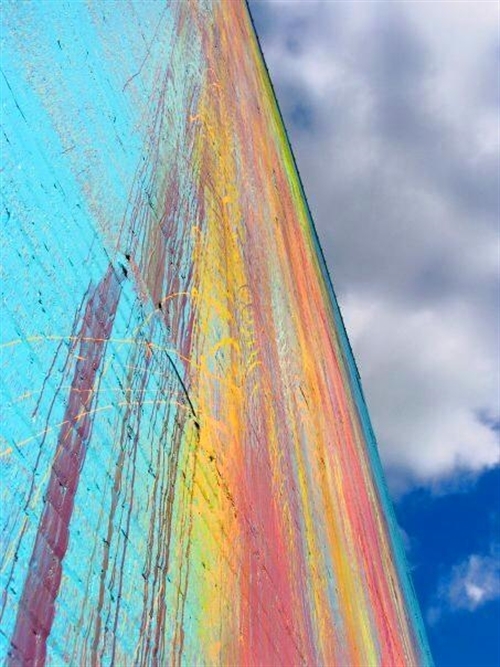 A 2010 Metro Times article by Ryan Hooper describes the cascading mural as a "psychedelic, 100-foot-by-125-foot splatter-and-drip job." The artist, who got a $33,000 grant from CCS to rent a crane and buy more than 100 gallons of paint, poured and splattered it on the building's western wall with help from schoolmates and other friends. 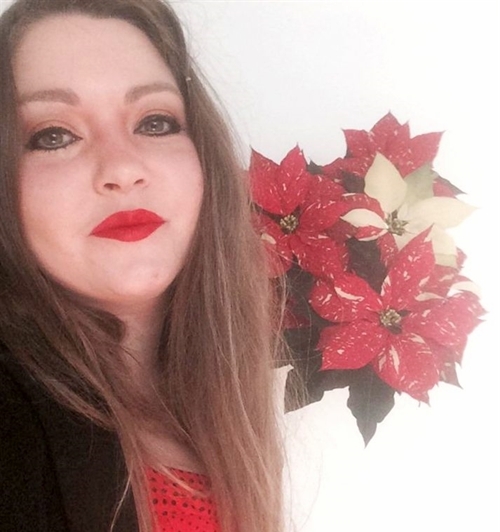 She used fire extinguishers to spray paint on some areas. She signed a contract with Boydell Development Corp., the building's owner at the time, and insured her artwork, her 14-page court complaint says. Her goal was to have "colors that stream down from the sky like falling tears," Craig says in a 2011 ModelD article by Ashley C. Woods. The 73,000-square-foot building was bought last January for $950,000 by Princeton Enterprises LLC, a property management and construction firm founded in 1994 by attorney Matt Lester. Its "redevelopment plans have put the future of Craig’s copyrighted mural at risk," her federal filing says. Plans for windows "threaten to destroy or mutilate the mural," the legal document adds. Craig, 31, wanted "colors that stream down from the sky like falling tears." The artist wants a judge to prohibit the Oakland owner from knocking down the building or punching holes through the mural for windows, writes Capps, who doesn't say what legal support is being provided. The injunction would further require Princeton Enterprises to notify potential buyers upfront about the mural’s protected status. . . .
Craig’s suit states that she never expressly agreed to waive her lifetime rights of attribution or integrity. The CityLab writer found just one similar case. From the perspective of a painting lover (or a Detroiter), "The Illuminated Mural" is a rich and irreplaceable work of art. Whether Craig’s most important work will survive as a mural is a question for the courts to decide. Here is the 14-page complaint in the case of Katherine Crag vs. Princeton Enterprises, LLC. 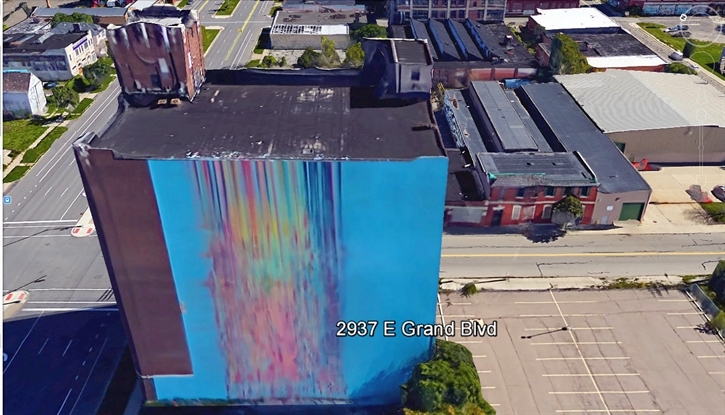 Google Earth view of the nine-story street art in Detroit's North End neighborhood.